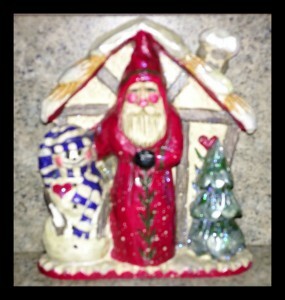 My little St. Nicholas figure is one of the first Christmas decorations to come out each year. You could call St. Nicholas a prototype Santa Claus. In some northern European cultures, children would get presents from St. Nick on December 6. He left the gifts in a shoe or sock left at the foot of their bed, or perhaps hung from a doorknob. In America, cities with German traditions, such as Cincinnati, start the Christmas season off with this guy. In what is probably a total lack of good sense given the level of animal mischief in this house, I am going to buy my Christmas tree today. I’ll get a wreath and maybe some pine tops for the patio planters. The lights are already on the house. Now we just need some snow.